I really think it’s worth the effort to make stock from scratch, not only because it’s more nutritious, but because homemade just tastes so much better than the one you get from a box. Many times you can get away with using water in a soup, but using a flavorful stock will usually make it better. Vegetable stock is much easier and quicker to make than chicken stock (you actually don’t want to simmer it for longer than an hour.) 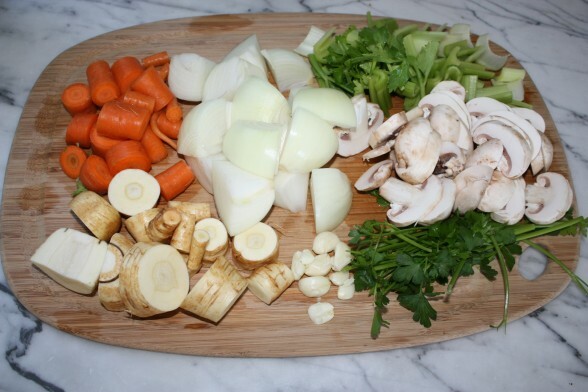 I like to cut my vegetables first because I think you get more flavor released into the broth. 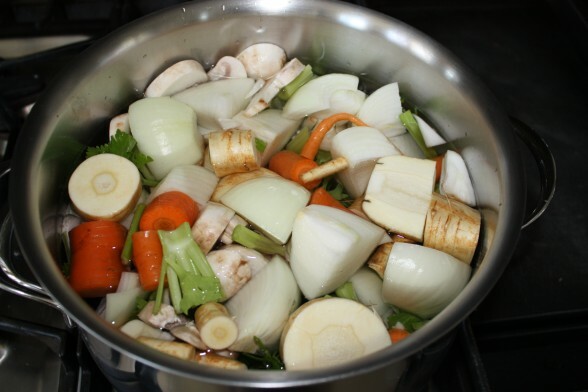 This vegetable stock is also great to use in pureeing baby food if you need a little extra liquid. 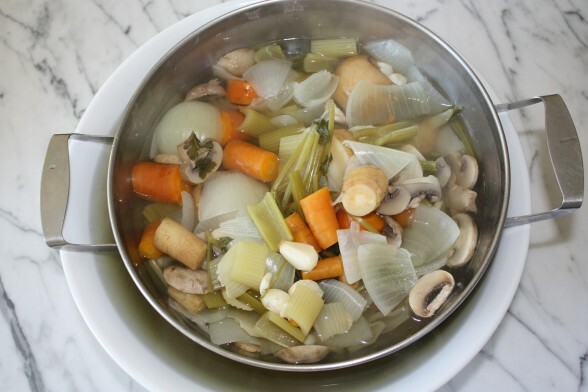 The recipe below is for my basic vegetable stock, but if I know what I’m using it for, such as a soup with asparagus and leeks, I will add other extras from those vegetables, too. The tops of leeks and the woody ends from asparagus make a great addition to stock. Just make sure everything is washed before putting it into the pot. My mother taught me to take fresh vegetable scraps that you would normally compost and keep a bag of them in the freezer. When you have a full bag of scraps, just put them in a pot with some additional chopped vegetables and water, and presto! practically free stock. The addition of kombu in my recipe is completely optional. It is a sea vegetable and gives your stock an extra boost of minerals. Use it if you have it on hand. Make sure you simmer the stock and don’t boil it vigorously since more liquid will evaporate that way. I don’t add salt to make vegetable stock, so keep that in mind when you are using this in a recipe. You may need to add a little extra salt to have the proper seasoning. 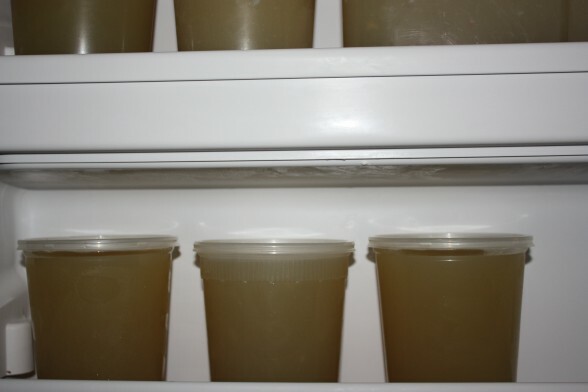 Vegetable stock lasts for 5 days in the refrigerator and up to 3 months in the freezer. I like to freeze it in 2-cup and quart containers because those are the sizes I use most often. But you can freeze the stock in any size container, even ice cube trays. If you are freezing in glass, make sure you freeze your liquid without a lid since it will expand. Once the stock is frozen solid, cover it tightly to protect is from freezer burn. Also check out my recipe for homemade chicken stock. Happiness is a freezer full of homemade stock! Place all the ingredients in a large pot and bring to a boil over high heat. Lower the heat and simmer uncovered for 30-60 minutes. Remove the pot from the heat and strain the stock into a large bowl. Push against the vegetables to extract additional liquid. Discard the vegetables. Store in the refrigerator for up to 5 days, or in the freezer for up to 3 months. 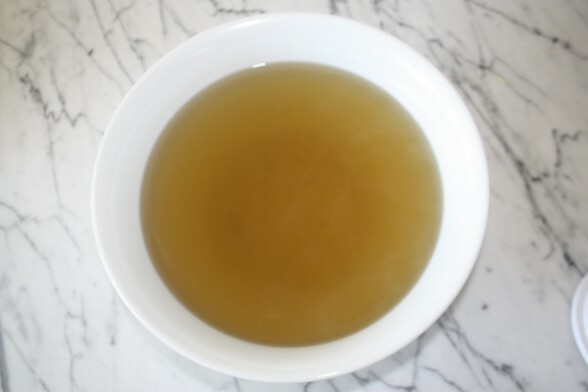 To increase the nutrients, simmer the stock with a strip of kombu. Other vegetables or scraps you can add that you might otherwise compost or discard: tops of leeks, parsley stems, woody ends of asparagus, shiitake mushroom stems, carrot peels, ends from squashes, etc. You can freeze these scraps until you are ready to make stock. I usually avoid sulfur-containing vegetables such as cabbage, broccoli and cauliflower since their flavors can be overpowering. I appreciate all your help! one more thing, when ordering the cups on letsgogreen.biz…. the only lids avai are straw lids or dome style….am i missing something or do i purchase one of these? The lids work on every size of the deli containers. Hope that helps! Could you also add onion skins to boil for broth? Sure! The skins add a nice golden color to both vegetable and chicken stocks. I suppose you could make it in a slow cooker, but you only need 30-60 minutes on the stove. It’s not like chicken stock where the longer the better. The vegetables don’t have more more to offer after they been simmered for an hour. But you could certainly do it. If I dont freeze stock in glass, what are the plastic containers in your photos that you use. Where can I purchase them? Thank you. I buy these in bulk from letsgogreen.biz. They are the deli compostable containers. They’re BPA-free, BUT they are technically not reusable so you can’t put them in hot water or the dishwasher. I like them because they’re stackable and they don’t take up too much space. Otherwise, Sistema makes BPA-free containers that you can find at The Container Store and amazon.com. When you say “discard the vegetables” after boiling, do you mean throw them out? Why not eat them? You can eat the boiled veggies if you want, but much of the flavor has gone out of the vegetables and into the broth. Also, they’re kind of mushy. That said, I have nibbled on a few carrots or parsnips after they’ve simmered. Is there a brand of vegetable stock you would recommend, if I’m in a rush and can’t make the vegetable stock from scratch? The tricky part about store-bought stocks is the additives. It’s very hard to find one without MSG, which goes by lots of different names. I have used the Whole Foods 365 brand which I probably like the best, although it’s a touch acidic. Pacific Organic Veg Stock which isn’t bad, although not a great color. Kitchen Basics is also acceptable, but the “natural flavors” in the ingredient list isn’t encouraging. If you just want to go by taste and you can deal with a little autolyzed yeast extract, Rapunzel Vegetable Bouillon with Herbs is good. Of course! See the suggestions above for other vegetables or scraps you can use instead. Just don’t leave them out and not replace them with anything else. can this be done without the parsnips and mushrooms?